Like the Official ROSE Facebook page or Follow Us on Twitter for the latest news, gossip and hype surrounding the film!! ROSE has it's first DVD release date in the USA on May 20th 2014!! Details of new releases and platforms worldwide will be promoted once we have recieved all confirmed release dates. A massive thank you to all who have supported this powerful true story as it is about to be seen by a wider audience with your support this truth can be seen and heard. Rose Has Landed a Distribution Deal! Rose the film is coming soon to a place near you! Due for release early 2014 with Shami Media, get the latest buzz and release dates from our official site www.rose-thefilm.webs.com, see photos, watch trailers PLUS an exclusive NEW video – a sneak preview of “A Thousand Faces” a fly on the wall feature documentary directed by Jack James to support the release of Rose following my Directorial journey in making this story. We need your support! Like our Facebook page! Follow Us on Twitter! Subscribe to our YouTube Channel! Rose - An Award Winning Film! 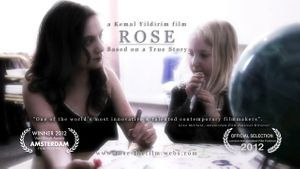 ROSE directed by Kemal Yildirim is a 2012 Amsterdam Film Festival Van Gogh Award Winner! Recognised for his Cinematic Vision Kemal is deemed as "one of the world's most innovative and talented contemporary filmmakers. Demonstrated by your work, this is recognition that you richly deserve." Gina McClain, Amsterdam Film Festival Director. ROSE the film is the most gritty urban drama story of our time set in an unspoken world that exists near all of us. Following completion in January 2012 the film based on a true story has already held two private screenings; firstly to the real Rose who was honoured to have her story represented by award winning director Kemal Yildirim and then to the cast, crew and sponsors of the film. Needless to say the response we received was overwhelming and we also managed to raise some funds for local supporting charity CAN, who provide a range of drug, alcohol and homelessness services in the region. Featuring new talent Helen Clifford as ROSE, a hopeful woman broken by drugs, prostitution and Blondie, the Czar of Hellville played by Mike Mitchell. The film boasts compelling performances from the cast including that of six year old Chelsea Alcock who plays Ellie, Rose’s daughter. Rose the film has already received an exclusive raving review from Michael Clark Ph.D. of Earthpages.com who understands and grasps the Director’s message and approach, and now the film has been officially selected for a prime time screening with Q&A at the London Independent Film Festival in April 2012 who thanked us for making “such a great film”. We are excited about what the future holds for Rose the film, and it would not be complete without the blessing from the true Rose. Thank you for letting us share your story. Rose the film is seeking sales agents and distribution as well as scheduled for festival exhibition. Please contact [email protected] to register your interest. Rose the film… Join the hype! Join the Movement! It’s been one month since calling ‘that’s a wrap’ on the main film shoot of ROSE, what feels like a lifetime ago! The two week shoot in July was INSANE, averaging at 20 hours filming a day with 3 hours sleep, fuelled by passion and our madness verified by the last shooting day clocking at least 25 hours!! Is it even more insane to mention that we miss it? Perhaps! August meant a period of rest and relaxation for the cast and crew, a time to get over the filming blues and to come to terms with reality. The film shoot ran at such a pace that we were Hellvillians living in Hellville, racking over 600 slates in 2 weeks compared to your average blockbuster film shoot of 400 slates in many months! The script was ambitious, creatively and technically; with many interior and exterior locations, a helicopter, fake torrential rain, a construction lift and far too much to mention! So needless to say we had a mammoth task in our hands. The low budget and small shooting period was also a major challenge, however lead by the equally if not more ambitious Director Kemal Yildirim we’re proud, firstly to survive the ROSE film shoot and secondly, realising the Director’s vision in capturing all that was intended using the Canon 5D with just a few filming pick up days left. The team are preparing for a day of filming at Hunstanton beach this weekend; a day in the life of ROSE’s disjointed family with ELLIE and TONY outside of Hellville, we get a glimmer of hope of what could be. This will be followed by a 3 day shoot at the end of September in Istanbul, Turkey: Mr Blondie also outside of Hellville but in another territory akin to his kingdom, setting the tone for Mr Blondie and the seed of destruction he brings back to Hellville. This will be ROSE completely wrapped in a total of 20 days of filming. We are thankful for the commitment and dedication from our supporters and all those involved in getting the film to this stage, we also humbly thank the sponsors on our Links page. Now lies ahead the daunting task of editing a full length feature film within a set deadline to be ready for festivals in 2012. Welcome to the den of post-production where Director Kemal and documentary filmmaker and now co-editor Jack James will bury themselves in the edit suite in ROSE HQ. Kemal is pleased with the dynamite footage feeling it is by far his best production to date and his biggest directorial debut. Exciting times ahead folks! Big thanks to BBC Radio Northampton for plugging us throughout pre-production and on set filming. Did we mention we are on IMDB? Well we are! We are yet to embark on a huge international marketing campaign and we’ve already been head hunted by sales agents before the film has even been edited. Plus, we have over 80 hours of behind the scenes footage (wow Jack! ), so the “too much to mention” of on-set trials and tribulations will be brought to you via the many featurettes coming soon! Not forgetting pictures and film stills!! Finally thank you to the REAL ROSE for allowing us to tell your story so publicly, we hope to do it justice and to bring forth the courage in ourselves to take control of our lives in whatever we do. To watch the teaser trailer for ROSE the film directed by Kemal Yildirim click here NOW! It's official. Rose is now in production, the realisation is here, all these months of long days and nights of pre-production, planning, co-ordinating, scheduling, sourcing, casting, set building, rewriting, acting workshops, etc, etc... Rose is here! It's Sunday 10th July on a lovely summers day with a gentle breeze, Rose and her young daughter Ellie are walking across a field passing by a shallow brook of water. All alone in this field we capture heart felt moments between mother and daughter. The production could not have started any better. A few words from the Director Kemal: "It's down to the wire: budget; getting things ready for the shoot; getting it right - everything! This film has my heart and soul in it and everyone is working hard on it. It's a lot of pressure but I can't believe we're here, Rose is here... It's time to have some serious fun!" Thank you all for your continued support and spread the word! Keep up to date on news and gossip by liking our Facebook page and share it with your friends, follow us on Twitter too! Join the movement! Join the hype! Rose is here!! Volunteers who wish to join the ROSE project please email us via the Contact Us page ASAP! One Month On, & One Month To Go!! The countdown is moving fast with only one month until filming starts! The team are bursting with excitement and cannot wait to get on set, however, there is much to do so the manic preparation is steam rolling ahead with no time to stop. The ROSE promotional trailer has been filmed. A snapshot of ROSE's life which sets the tone of the film and what we as an audience can expect to witness. The trailer is in the cutting room as we speak and will be coming soon! So watch this space!! The technical foundation of the film is being laid today with the first production crew meeting, discussing the locations and logistics of filming, equipment, camera, sound, etc. The production value of the film is unfolding thanks to the amazing locations available to us courtesy of local businesses and the County Council. The creative process is underway as the director Kemal Yildirim buries himself in the script. The creative team continue the successful acting workshops which is key preparation for the two week film shoot in order to capture ultimate realism, because the story being told is based on a true story. The creative team are campaigning in every possible manner to promote the film and call on support, through social networking sites, radio, news and magazines. Our current campaign for recruiting FILM EXTRA's has received an overwhelming response so thank you to those who have got in touch, and if you wish to take advantage of this opportunity then visit our CONTACT US page. ROSE can only be a good thing, supporting charity, promoting British independent filmmaking and the arts within Kemal's hometown, boasting local creative talent, landmarks and businesses, bringing talent to the town and ultimately to the movie screen. We hope to raise awareness of ROSE and her shocking story, to get behind the movement please like our Facebook page and share it with your friends, we are thankful for your support. Thank you for reading and TTFN! The official documentary filming has started! Filmmaker Jack James has joined the ROSE movement to document our journey throughout the whole process, starting with our manic pre-production days in the office. Jack will be filming exclusive behind the scenes access to trials and tribulations that we encounter daily in order to bring this film to life. This documentary will be a valuable feature to bring you ever closer to the team behind Hellville, and like an Iceberg to see what is below the surface of the film. Exciting times ahead!! It's been one month since pre-production began and the ROSE team are set up and rolling in our production office. Working in what was a creative space for many decades before our arrival can only be a sign of good things to come! Excitement and steam rolling are a few words that spring to mind. Having moved in to the office the set layout is in place and the builders are working on plans to construct the heart of ROSE's world; locations are being scouted and secured; main cast are attached with some exciting names and talent in the bag; acting workshops are in full swing to bring the characters to life as are the creative sessions between Writer and Director to plan scene for scene the Director's vision of this heartfelt story. It's all go! This is only the beginning with so much more to do. The countdown is on with 10 weeks to go til the film shoot, may we remind our readers that this is for a feature film to be shot in two weeks! We must thank our local town, some companies (unnamed for now) and charities, in particular CAN, for their support and belief in the film (to find out more about CAN visit our LINKS page). This is more than a film it is a movement, to raise awareness on victims like ROSE and the harsh realities that people like her suffer on a daily basis. To help tell ROSE's story we are on the lookout for extras, if you are interested or if you wish to support the film in any capacity please get in touch. office: 69b Kettering Road, Northampton, NN1 4AW. Kemal Yildirim was invited to BBC Radio Northampton today to discuss ROSE. The film is now officially in pre-production to be shot in July 2011 and Kemal discusses the film being more a movement rather than a standard film. Using local resources and local talent and bringing filmmaking to the county the film is close to being realised. Kemal requests the community's support to get behind the film whether it be creatively (crew/actors/extras) or even potential investors/sponsors to get behind the movement. To listen to the interview on BBC iPlayer click here http://www.bbc.co.uk/iplayer/console/p00fp1qw (forward the iPlayer to 12:00 minutes).